A new study by geoscientists at the University of Liverpool has identified the temperature at which cooling magma cracks to form geometric columns such as those found at the Giant’s Causeway in Northern Ireland. Geometric columns occur in many types of volcanic rocks and form as the rock cools and contracts, resulting in a regular array of polygonal prisms or columns. 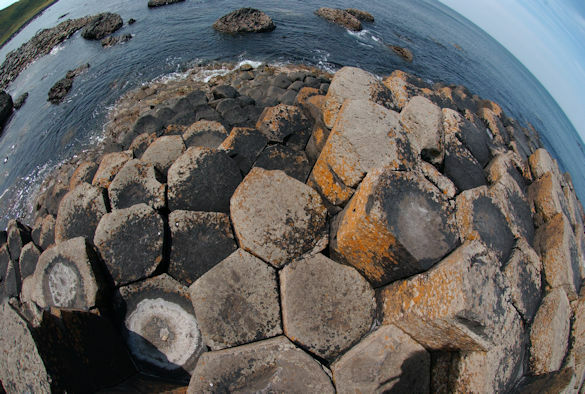 Columnar joints are amongst the most amazing geological features on Earth and in many areas, including the Giant’s Causeway, they have inspired mythologies and legends. One of the most enduring and intriguing questions facing geologists is the temperature at which cooling magma forms these columnar joints. Liverpool geoscientists undertook a research study to find out how hot the rocks were when they cracked open to form these spectacular stepping stones. In a paper published in Nature Communications, researchers and students at the University’s School of Environmental Sciences designed a new type of experiment to show how as magma cools, it contracts and accumulates stress, until it cracks. 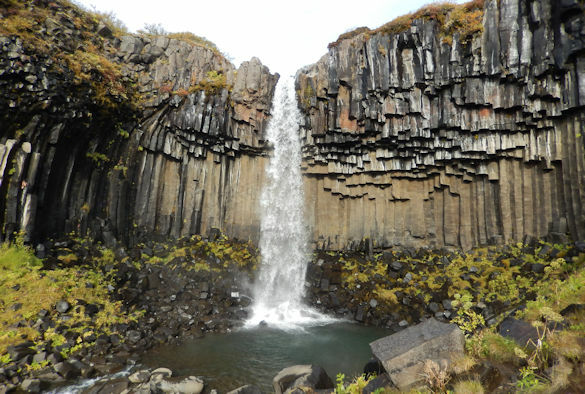 The study was performed on basaltic columns from Eyjafjallajökull volcano, Iceland. They designed a novel apparatus to permit cooling lava, gripped in a press, to contract and crack to form a column. These new experiments demonstrated that the rocks fracture when they cool about 90 to 140˚C below the temperature at which magma crystallises into a rock, which is about 980˚C for basalts. This means that columnar joints exposed in basaltic rocks, as observed at the Giant’s Causeway and Devils Postpile (USA) amongst others, were formed around 840-890 ˚C. Yan Lavallée, Liverpool Professor of Volcanology who headed the research, said: “The temperature at which magma cools to form these columnar joints is a question that has fascinated the world of geology for a very long time. We have been wanting to know whether the temperature of the lava that causes the fractures was hot, warm or cold. Dr Anthony Lamur, for whom this work formed part of his doctoral study, added: “These experiments were technically very challenging, but they clearly demonstrate the power and significance of thermal contraction on the evolution of cooling rocks and the development of fractures”. Dr Jackie Kendrick, a post-doctoral researcher in the group said: “Knowing the point at which cooling magma fractures is critical, as –beyond leading to the incision of this stunning geometrical feature– it initiates fluid circulation in the fracture network. Understanding how cooling magma and rocks contract and fracture is central to understand the stability of volcanic constructs as well as how heat is transferred in the Earth. The paper “Disclosing the temperature of columnar jointing in lavas” is published in Nature Communications (doi:10.1038/s41467-018-03842-4). The research was funded by the European Research Council (ERC).